You can contact the LPA Committee Chair using our webform. The goal of the RASC Light-Pollution Abatement (LPA) Program is to reduce the levels of light pollution in urban and rural areas by advising Federal, Provincial and Municipal governments and departments along with business and concerned citizens to take action to reduce unnecessary glare, uplight and light trespass. Cinzano Canada Image, showing Light Polluted Areas. White areas, are very heavily light polluted. Black = "dark sky" and White = "light polluted". It is a constructive and advisory program that encourages meetings at the local level between concerned citizens and governments, business and the media to inform and advise these groups on the problems created by light pollution. We provide practical recommendations to reduce obtrusive lighting. The program is managed by the RASC LPA Committee consisting of volunteers from across Canada. The RASC National LPA Committee supports local initiatives with the distribution of information and presentation materials. These are in the form of printed booklets, information sheets, and a slide set to complement a formal presentation on light-pollution abatement. On the strategic national and regional level, the Committee recommends to Federal and Provincial governments the use of non-polluting exterior lighting designs and luminaires in projects under their jurisdiction. Further, the Committee advises governments as part of their infrastructure maintenance and renewal to replace older luminaires that produce glare and light trespass with luminaires with the full cut-off optics. In 1991, the Royal Astronomical Society of Canada established its Light-Pollution Abatement Committee to support measures to reduce Light Pollution. making representations to governmental bodies. 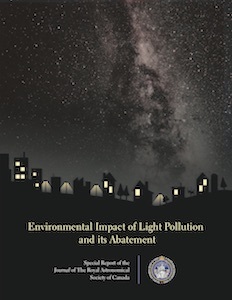 "The Environmental Impact of Light Pollution and its Abatement"
The Royal Astronomical Society of Canada has published The Environmental Impact of Light-pollution and its Abatement, as a special supplement to its internationally recognized periodical, the Journal.